You wouldn’t select a doctor based solely on cost, or trust a physician who writes a prescription before diagnosing your condition. So why choose a security software solution based on a rubber stamp RFP checkbox or a vendor’s own marketing claims? Avoid years of expensive service engagements that never deliver expectations. 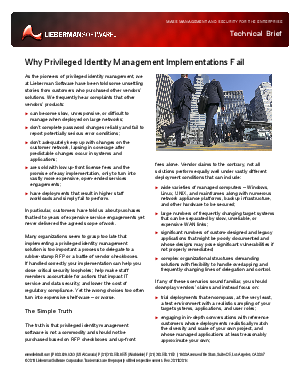 Download “Why Privileged Identity Management Implementations Fail” to learn how to quickly implement a solution that can both lower your IT staff’s workload and protect access to your organization’s most sensitive data.